Have you purchased your tickets yet for the RootCellar 2013 Spring Seminar with Thomas MacEntee? More than half the seats have already been reserved so don't delay! Learn some of the most important online resources for genealogical research. Learn how to organize your bookmarks and lists into an easy-to-access, portable virtual toolbox. Learn how to navigate this website and leverage the best strategies to download its resources. Social networking programs will be de-mystified. 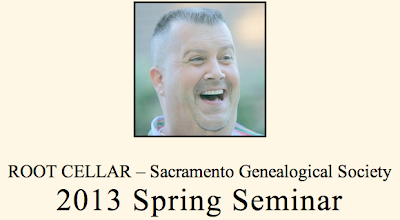 Learn how each program is currently being used by genealogists and family historians of all ages. Learn what’s hot in the world of apps and websites and how you can start using them. This talk includes a review of a group of familiar apps and websites being used in creative ways by the genealogy community. Root Cellar Member – $25; Non-member – $30; After March 1st – $35. Optional Lunch by TOGO’S - $7.00 each. Download the registration form and flier. NOTE: Due to the high interest in this seminar, early registration is highly encouraged. No registrations will be sold at the door. Confirmations will be mailed and no refunds once you have registered. Your check will be returned if it is after received after the event is sold out. When he’s not busy writing blog posts, organizing the 2,800+ members of Geneabloggers, teaching online genealogy webinars and more, Thomas MacEntee is busy in his role as “genealogy ninja.” Stealth is not easy, but he manages to get the inside track on emerging technologies and vendors as they relate to the genealogy industry. After being laid off from a twenty-five-year career in the tech industry in 2008, Thomas has been able to “repurpose” his skill set for the genealogy community and he loves to see other genealogists succeed, whether it is with their own research or building their own careers in the field.